The Conchservation Campaign was formed in response to concerns raised by scientists and fishermen about the decline of Queen Conch (Lobatus, formerly Strombus, gigas) populations in The Bahamas (Stoner et al, 2012). Research in The Bahamas indicates a mature Conch, one that has had a chance to reproduce, has a minimum lip thickness of 15 mm. Reproduction is the means by which our Conch stocks maintain and rebuild themselves. The current regulations prohibits the harvest of a Conch that does not have a well formed flaring lip. The current regulations which allow the harvest of conch with a well formed, flared lip are vague and do not protect immature conch from harvest. The overall goal of the Campaign is to create a sustainable fishery in The Bahamas and the first step is to implement a harvest rule that protects animals until they have had a chance to reproduce. Conchservation Campaign partners including the Department of Marine Resources are advocating for an amendment to the current regulations that prohibits the possession of an immature Conch. 27. (1) No person shall take, have in his possession or sell any conch the shell of which does not possess a well formed flaring lip. (2) No person shall sell any conch shell which does not possess a well formed flaring lip. 27. (1) No person shall take, have in his possession or sell any conch the shell of which does not possess a lip thickness of 15mm or greater. 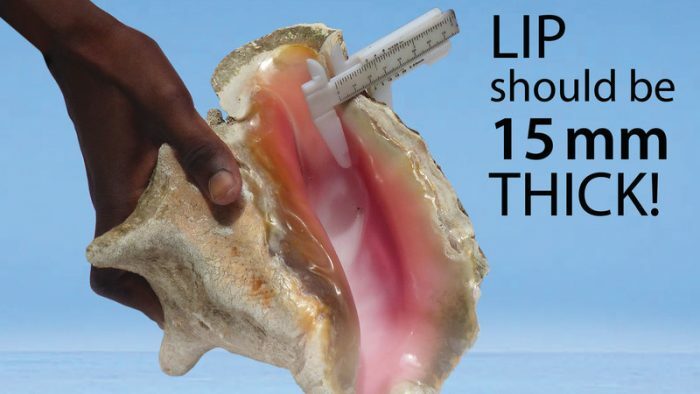 (2) No person shall sell any conch shell which does not possess a lip thickness of 15mm or greater. Your support can help save Conch, for generations to come.